Never let the truth get in the way of a good diversion. Not wishing to waste any more time amid the tequila-fuelled holiday turmoil of Cabo San Lucas, on the southern tip of the Baja California peninsula, I hailed a minivan to whisk me 70 kilometres north to the village of Todos Santos where, more specifically, I wanted to visit the Hotel California. The Eagles frontman Don Henley has denied he ever stayed here, and has said the band’s most famous Eighties hit song had more to do with Satanism than any tale of time spent in Mexico. ‘The Devil take all unfounded rumours’ I said to myself as I strode into the hotel’s lobby. The lyrics of that memorable song did at least support the fanciful conjecture that I might possibly be in the right place. 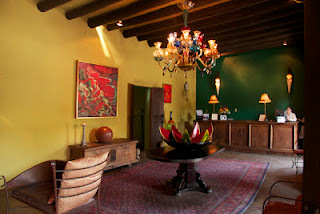 The Hotel California is adjacent to the historic Jesuit Mission of Todos Santos and I could almost imagine that mission bell tolling. 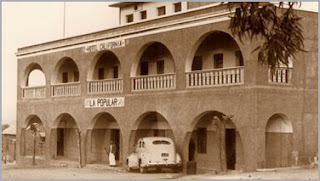 The most famous building in town was constructed in the late 1940s and opened for business in 1950. These days it’s owned by an American businessman. It plays down any connection with the Eagles hit yet certainly looks like the sort of place where a rock singer might hang out …. and perhaps never leave. The Hotel California has 11 comfortable suites set around a shady courtyard and small swimming pool. Through the tall trees surrounding the pool you can see the white walls of the mission church. It’s exactly the sort of exclusive hideout you’d imagine finding many a celebrity chilling out. However tenuous its connection to rock and roll fame, the Hotel California has long been and remains still a powerful tourist drawcard. Todos Santos itself has been officially designated a Pueblo Magico by Mexican Tourism and has some small but lovely art galleries and, if you look long enough, there are some exquisite items of silver work for sale. In addition to select accommodation, the Hotel California also makes a healthy profit, I would imagine, from its restaurant and adjacent gift shop selling branded clothing, caps, bags and other assorted paraphernalia. Popular as its restaurant may be with visitors, I found far better fare directly across the road at Tequila’s Sunrise, where the owner Emmanuel – “call me Mister Margarita” – holds court espousing the finer details of mixing this signature cocktail. I ordered the restaurant’s speciality, chili relleno, a sweet pepper stuffed with a variety of cheeses, served with a fresh tomato sauce and sprinkled with pomegranate seeds. This dish is the true taste of Todos Santos – not the stuff of dubious legend.